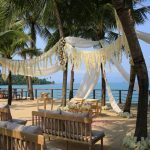 Romantic view of the Gulf of Thailand with row and row of coconut trees and white beaches establishes Koh Samui to be one of the top wedding and pre-wedding photoshoot locations in Thailand. 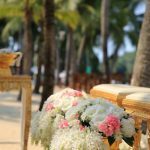 Samui Palm Beach Resort is among the top-picks for many couples who choose to have their big day ceremony here. 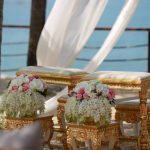 From intimate cocktail receptions for two to lavish buffet dinners for the whole family of both the bride and groom, we can organize the memorable wedding to suit your personal style, traditions or culture. 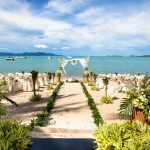 With our longest beach area of any resort in Koh Samui and largest convention room which can accommodates up to 500 attendees, even mass wedding ceremony can take place at Samui Palm Beach Resort. Your happy marriage can be started here with us. Accommodation for 4 nights including breakfast for 2 persons at the restaurant. Welcome drink & tropical fruit in room upon arrival. Honeymoon or anniversary set up (with Cake) in room upon arrival. One Time 90 minutes Aromatherapy Oil Massage for 2 persons at CELES Spa. One Private Set Dinner for 2 persons (food only). 30% Discount on Spa Treatment (Exclude promotions) at Celes Spa. Complimentary Wifi in all resort area. Special package for direct booking only.